Today's growing businesses demand and rely more on their network to carry out mission-critical business activities. Companies are putting more network traffic and applications on their Ethernet infrastructure. For example, the increasing deployments of VoIP phones and IP cameras require more than simple plug and-play connectivity. It needs the network intelligence to separate the voice and video traffic from data, and prioritize them accordingly. Additionally, Internet-based applications such as Hotmail and Google Calendaring have made keeping the network up a business-critical need. However, companies do not necessarily have more money or advanced training to deal with complex managed switches. 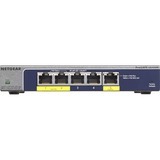 The NETGEAR ProSAFE Plus Switches meet this growing need by providing fundamental network features that will help optimize the performance of business networks. ProSAFE Plus Switches also offer traffic monitoring for users to observe traffic behavior. If there are connectivity issues, these switches can identify and even locate connection problems via cable diagnostic test. To optimize traffic through the switches, ProSAFE Plus Switches offer both port and tag-based prioritization to keep latency-sensitive traffic moving ahead of less critical packets. Also, ProSAFE Plus Switches offer port and 802.1Q-based VLAN as a means of improving security and network performance. ProSAFE Plus Switches are an upgrade from the plug-and-play Unmanaged Switch, delivering great value for empowering your network, delivering great value to the end user.